BATON ROUGE, La. — Tua Tagovailoa threw two touchdown passes and ran 44 yards for a score in his toughest test this season, Alabama's defense stifled No. 4 LSU, and the top-ranked Crimson Tide remained unbeaten with a 29-0 victory Saturday night. Alabama led 16-0 by halftime and forced LSU punts on the Tigers' first nine possessions. LSU drove to the Alabama 15 on its 10th series early in the fourth quarter, only to miss a field goal with 10:45 to go. Tigers quarterback Joe Burrow completed 18 of 35 passes for 184 yards. He was sacked five times and had a pass intercepted. CLEMSON, S.C. — Travis Etienne ran for 153 yards and two touchdowns and 350-pound defensive tackle Dexter Lawrence added a 2-yard scoring burst for Clemson. Linebacker Isaiah Simmons had a pick-six, the Tigers collected five sacks, coach Dabo Swinney's eldest son Will caught a TD pass and even "Big Dex," a junior defensive tackle projected as a can't-miss, NFL first-rounder got in on the fun in the Tigers' "Fridge Package" against overmatched Louisville (2-7, 0-6). EVANSTON, Ill. — Ian Book threw for threw two touchdown passes and ran 23 yards for a score in the closing minutes to lead Notre Dame. ANN ARBOR, Mich. — Shea Patterson accounted for three touchdowns and Michigan put together a dominant performance on defense. The Wolverines (8-1, 6-0 Big Ten, No. 5 CFP) moved a step closer toward their goals of winning a conference championship for the first time since 2004 and earning their first spot in the College Football Playoff. The Nittany Lions (6-3, 3-3, No. 14 CFP) scored with 1:59 left, avoiding getting shut out for the first time since 2001 against Michigan. Karan Higdon ran for 132 yards and a score that put the Wolverines up 35-0 early in the fourth quarter. Michigan held Penn State to 186 yards and forced three turnovers, including Tommy Stevens' interception that was returned 62 yards by Brandon Watson for a touchdown. LEXINGTON, Ky. — D'Andre Swift ran for a career-high 156 yards and two touchdowns on 16 carries against Kentucky's vaunted defense and Georgia wrapped up its second straight Southeastern Conference Eastern Division title. Swift had an 83-yard breakaway in the third quarter that gave Georgia (8-1, 6-1, No. 6 College Football Playoff) a 28-3 lead. He also had a nifty 20-yard scoring run in the second period when the game was close. Elijah Holyfield ran for a career-high 115 yards on 18 carries, scoring on a 4-yarder in the third quarter. LUBBOCK, Texas — Kyler Murray recovered from a pair of early interceptions that led to a two-touchdown deficit, throwing for 360 yards and three touchdowns and running for 100 yards and another score to rally Oklahoma. The Red Raiders (5-4, 3-3) led 31-28 at halftime, but freshman quarterback Alan Bowman didn't return in the second half of their eighth straight loss against a Top 10 team going back to 2012. Texas Tech officials didn't immediately say why Bowman left the game. 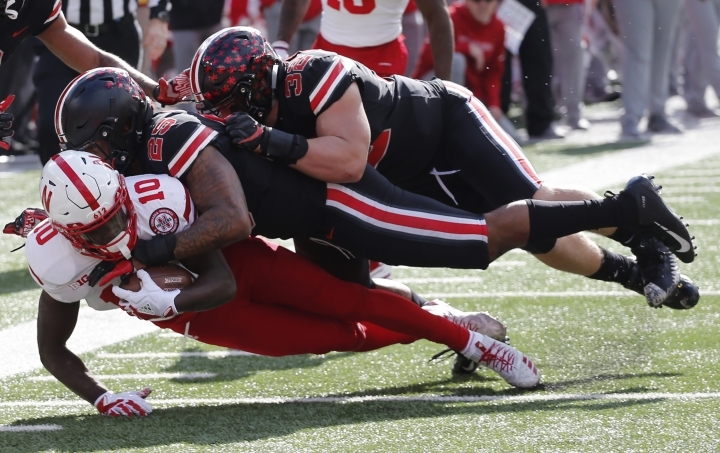 COLUMBUS, Ohio — J.K. Dobbins ran for three touchdowns and Dwayne Haskins Jr. passed for two more scores to help Ohio State beat Nebraska. Martinez threw for 266 yards and touchdown and rushed for two scores for Nebraska (2-7, 1-5). PULLMAN, Wash. — Gardner Minshew threw a 10-yard touchdown pass to Easop Winston Jr. with 32 seconds left to lift Washington State past California, extending WSU's long-shot quest to crash the College Football Playoff. AUSTIN, Texas — Will Grier threw a 33-yard touchdown pass to Gary Jennings with 16 seconds left, and then ran in the 2-point conversion to lift West Virginia past Texas. Grier broke his finger on a run to the pylon in the first quarter of a loss to Texas last year, and his winning run came on a similar scramble. But there was no defender near him this time as he held the ball up while crossing the goal line untouched. GAINESVILLE, Fla. — Drew Lock picked apart Florida's defense for the second straight year, throwing three touchdown passes to lead Missouri. Lock completed 24 of 32 passes for 250 yards, with scoring throws to Albert Okwuegbunam, Kam Scott and Emanuel Hall that stunned the Swamp. Fortunately for the Gators (6-3, 4-3 Southeastern Conference), they won't have to face the senior and possible first-round draft pick again. TEMPE, Ariz. — Manny Wilkins threw three touchdown passes to N'Keal Harry and Arizona State beat Utah, knocking the No. 16 Utes out of sole possession of first place in Pac-12 South. The Utes (6-3, 4-3 Pac-12) lost quarterback Tyler Huntley to a broken collarbone in the third quarter. The loss snapped Utah's four-game winning streak. Harry caught nine passes for 161 yards, including TD catches of three, 23 and 61 yards. His three TD catches were a career high. Wilkins completed 19 of 24 for 285 yards and three scores with one interception. Eno Benjamin rushed for 175 yards, including a 44-yard TD run that sealed the victory with 4:12 to play. Arizona State (5-4, 3-3) gained 536 yards against a Utah defense that had been ranked No. 1 in the Pac-12. 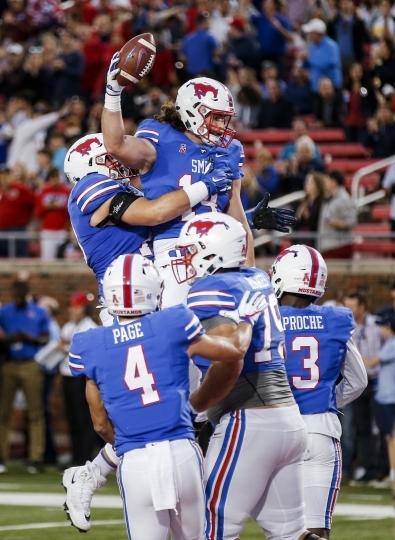 DALLAS — Ben Hicks threw for 318 yards and four touchdowns and SMU beat Houston, the second time in three years the Mustangs upset a ranked Cougars team. After Houston (7-2, 4-1, No. 17 CFP) got to 38-31 on quarterback D'Eriq King's 3-yard touchdown run with 9:34 left, the Mustangs went on a time-consuming 13-play drive that ended with Ke'Mon Freeman's second touchdown run, an 8-yarder with 2:43 left. That drive was interrupted for about 90 minutes because of lightning and heavy rain. Freeman ran 20 times for 107 yards. HONOLULU — Darwin Thompson and Gerold Bright each ran for three touchdowns as Utah State extended its winning streak to eight games. Cole McDonald threw a pair of touchdown passes for Hawaii, which finished with 390 yards of total offense. WEST LAFAYETTE, Ind. — Spencer Evans made a 25-yard field goal with 8 seconds left, lifting Purdue past Iowa and back in the Big Ten's West Division title hunt. David Blough threw three touchdown passes to Terry Wright and topped the 300-yard mark for the fifth time this season. The Boilermakers (5-4, 4-2 Big Ten) have won five of their last six and beat their third ranked team this season — the first time they've achieved that feat since 2003 — to move within one game of division leader Northwestern. The Hawkeyes (6-3, 3-3) lost their second straight road game despite Nate Stanley's big day. The junior quarterback threw for 275 yards with one TD and ran for another but the conference's No. 2 scoring defense allowed a season-high point total.And when the Hawkeyes needed one last stop, Blough drove Purdue 43 yards to set up Evans for the winning kick. LAS VEGAS — Marcus McMaryion threw for two touchdowns and 274 yards and Fresno State's defense had a near-perfect game. KeeSean Johnson had eight receptions for 97 yards to move his streak to 45 consecutive games with a catch. Coming into Saturday, Johnson led the nation in active career receptions at 234. Fresno State's defense only allowed the Rebels over midfield twice in the first three quarters. Charles Williams, a Fresno native, was the lone bright spot for UNLV (2-7, 0-5) as he rushed for 121 yards on 16 carries. UNLV's Max Gilliam was 14 of 30 for 98 yards for the Rebels, who will not be bowl eligible due to the loss. WINSTON-SALEM, N.C. — Eric Dungey rushed for 119 yards and a touchdown, Jarveon Howard ran for two scores and Syracuse beat Wake Forest. Sam Hartman was 21 of 37 for 275 yards for the Demon Deacons (4-5, 1-4) with two touchdown passes. STARKVILLE, Miss. — Nick Fitzgerald threw for 243 yards and four touchdowns and Mississippi State beat Louisiana Tech. BLACKSBURG, Va. — Travis Levy ran for two touchdowns and Boston College beat Virginia Tech to set up a huge home game against Clemson next week. 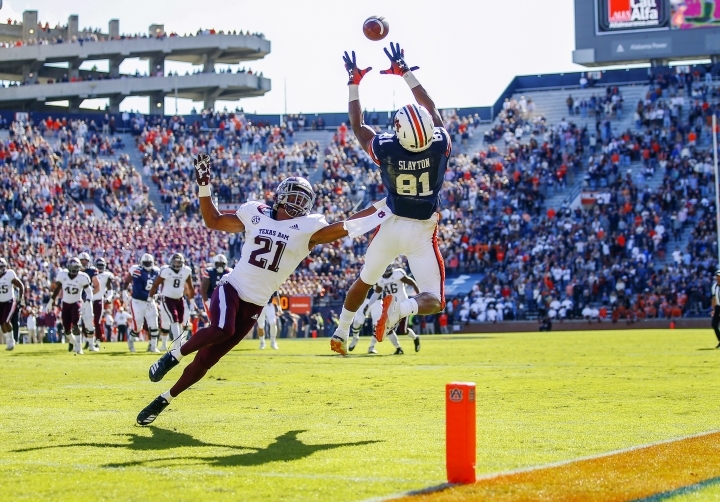 AUBURN, Ala. — Seth Williams caught an 11-yard touchdown pass from Jarrett Stidham with 1:41 left and Auburn rallied to beat Texas A&M. Kellen Mond and the Aggies (5-4, 3-3) pushed the ball into Auburn territory on their final drive, converting a fourth-and-5. Then a holding call pushed them back across midfield and Mond's desperation pass into the end zone was incomplete. Officials put a second back on the clock, and Mond was sacked by Nick Coe on the final play.